Regardless of where they're headed, the most common affliction suffered by air travellers is 'gate anxiety' - the fear of straying too far from their departure area and missing an important announcement, or their flight entirely. 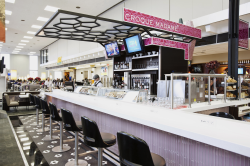 Until recently it was a condition generally considered incurable, but with the opening of innovative, high quality restaurants such as Bar Brace and Croque Madame in JFK's Terminal 3 that's no longer the case. Developed by OTG Management, Bar Brace and Croque Madame are not your average airport restaurants. 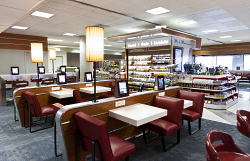 In addition to allowing customers to order directly from their seats via iPads provided on site, the award-winning eateries feature menus developed in collaboration with local chefs and offer passengers great food and an authentic restaurant atmosphere right at their gate. To create that atmosphere, OTG depends heavily on custom music programming and state of the art Audica Professional MICROseries audio systems provided by NYC's EL Media Group. "Airports aren't known for good sound," says EL's Chief Creative Officer, Ernie Lake, "but it's not just about the food for OTG. They're very in tune to music, so we have to have incredible programming and incredible sound." The central problem in meeting that mandate is selecting a system that can provide high intelligibility in spaces that are typically large and extremely live, and will physically fit into a restaurant where space itself is very much at a premium. Luckily, Audica Professional's MICROseries isn't your average sound system. Featuring Class D amplifiers and onboard EQ, Audica's MICROzone controller/amp and MICROplus 4-channel power amp combination are compact enough to fit into a small cabinet at each restaurant's point of service. They power two Audica Professional MICROdot ceiling loudspeakers mounted above the bar and four surface-mount MICROline loudspeakers placed around the perimeter of the space. To give really well balanced sound, a compact active MICROsub is used to extend the low frequency. 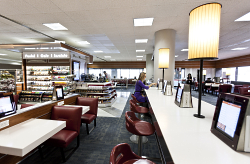 Owing to the system's compact footprint, sonic clarity and sleek design, Audica Professional has swiftly become OTG's system of choice for similar projects such as Bar Brace in LaGuardia's Terminal D as well as Cibo Market and Revive Bar in Terminal F at the Philadelphia International Airport. "The sound quality is great, but the speakers also blend in very well with the restaurant's overall look, which is modern and bold," says OTG's Justin Blatstein. "We really don't have room to hang up large speakers, so to be able to get speakers of this quality and this size is very important - Audica just fits in perfectly." Established in 2008 in an effort to offer custom designed audio solutions to complement their existing music styling services, EL Media Group's installation arm provides audio design/install services for a variety of high-end hotel, restaurant and retail applications across the United States.